Is green tea skin care just another “fad,” or can it restore the natural beauty of your complexion? 5 top tips to buy your perfect skin cream. Over the past decade, green tea has developed quite a reputation as a “health food,” as researchers have uncovered a variety of health benefits. You may be aware that it is good for your body. But do you know that it also shows up as a key ingredient in a variety of skin and hair care products? There is scientific research showing that green tea has a variety of beneficial properties when used topically. Want to know what green tea is supposed to do for your skin, and how to choose products that effectively harness its beneficial properties? Green tea contains a cocktail of potent antioxidants called catechins, which help fight damage caused by free radicals. Free radicals are molecules that are missing an electron - they are inherently unstable, and always trying to steal an electron from the other molecules around them. Free radicals can form in your skin for a variety of reasons, including exposure to toxins. However, the most common cause of free radicals in skin cells is UV radiation from sunlight, which causes up to 90% of all signs of premature aging. Want to know why green tea is so indispensable as antioxidants? In several scientific studies, green tea extract was shown to neutralize the damage done by exposure to UV rays. A 2000 study by Case Western Reserve University showed that green tea protects against sunburn. Volunteers had green tea extract applied to the skin on their buttocks, which was then exposed to solar radiation. At a concentration level of 4 milligrams per 2.5 cm square of skin area,, the subjects obtained complete protection from sunburn. Some protection was observed at lower concentrations down to 1 milligram per cm square of skin area. Since exposure to sunlight is a major factor that ages the skin, it is reasonable to assume that green tea cream could help prevent premature aging. No one is advocating giving up your sunscreen in favor of green tea just yet, but green tea can definitely help enhance its effectiveness. Green tea’s antioxidant effects may help prevent skin cancer. A 2003 study published in the American Chemical Society discovered that green tea prevents skin cancer by blocking the harmful enzyme junk-2. A recent 2007 study conducted in the UK revealed that those who drank two or more cups a day had a 65% lower risk of developing squamous cell carcinoma. Interestingly, the same study noted that drinking tea with lemon boosts its anti-cancer properties. Green Tea And Skin Cancer - Lotion Or Beverage? 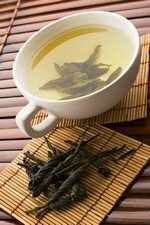 One study, performed in 2003 by Dr. Stephen Hsu of the Medical College of Georgia Department of Oral Biology, found that green tea was able to rejuvenate old skin cells that were at the end of their life cycle. Thus, we report here for the first time, that at certain concentrations, EGCG or a mixture of the major green tea polyphenols stimulated aged keratinocytes to generate biological energy and to synthesize DNA, possibly for renewed cell division. Therefore, green tea constituents may be useful topically for promoting skin regeneration, wound healing, or treatment of certain epithelial conditions such as aphthous ulcers, psoriasis, rosacea, and actinic keratosis. Although this is an amazing finding, it is too early to say what this means for consumers. So don’t be fooled by claims that green tea “reverses the aging process,” as it has only been shown to do so for individual skin cells, not for the face as a whole. Prevention is one thing. Turning back the clock is completely different! However, green tea may help increase elasticity when used continuously, so it may help reduce the appearance of fine lines and wrinkles even if it can’t remove them completely. Green tea also has a powerful anti-inflammatory effect. If your skin is very sensitive and often red, products containing green tea extract may help soothe it. People with skin conditions such as psoriasis, rosacea, and dandruff, which are caused by inflammation, may benefit the most from the anti-inflammatory action of the chemicals in green tea. In a 2007 study published in Experimental Dermatology, green tea was shown to significantly lessen the severity of psoriasis in mice. Green Tea And Hair - Dandruff And Psoriasis Cure? Everyone has experienced a bad case of acne at least once in their lives - usually at the worst possible time. In addition to the benefits listed above, green tea catechins are anti-bacterial and can decrease hormone activity. This means green tea is an effective way to control acne, without the unpleasant side effects of benzoyl peroxide-based creams. A 2003 study carried out by Dr. Jennifer Gan-Wong of Memorial Medical Center in the Philippines showed that green tea cream was as good as benzoyl peroxide cream in treating acne conditions with fewer side effects. The researchers noted the green tea cream seemed to lighten patients' skin color and improve the overall appearance of their complexion. This is excellent news, since benzoyl peroxide is often irritating to the skin, and can cause damage in the form of free radicals. Now that you know about green tea skin care's amazing potential, how can you make sure that the products you buy will actually be effective? My next article will give you the information you need to make an informed decision when purchasing products that claim to deliver the benefits of green tea to your skin. Green Tea Polyphenol Treatment to Human Skin Prevents Formation of Ultraviolet Light B-induced Pyrimidine Dimers in DNA (2000). Santosh K. Katiyar, Anaibelith Perez and Hasan Mukhtar. Clinical Cancer Research Vol. 6, 3864-3869, October 2000.